The group sends in application to Kuching North City Hall despite a road blockade set up by municipal officers. KUCHING: Sarawak Bersih organisers have submitted an application to use an iconic field in central Kuching for the Bersih 5 rally on Nov 19. Bersih Sarawak Vice-Chairperson Ann Teo submitted a letter of request at 12.30pm at the Kuching North City Hall (DBKU) headquarters, seeking permission from Mayor Abang Abdul Wahap Abang Julai for use of the Padang Merdeka. The group managed to submit its application despite a road blockade set up at the premises of the DBKU headquarters today. Four Bersih members, including Teo, showed up. Teo said the group would be submitting an additional notice to police, under the Peaceful Assembly Act 2012, whereby notice must be given 10 days before any gathering. Teo said Bersih wanted a smooth rally, like last year’s gathering in Kuching, where permission was obtained for use of the SK Song Kheng Hai rugby field for the Bersih 4 rally. She hoped police will take action against such provocateurs and “those who threaten the safety of the public”. A convoy of three dozen vehicles, sporting Bersih flags and banners, started a statewide journey in Miri on Oct 1, making its way to Bintulu, Sibu and other towns. It is expected to make its way through Sri Aman on Oct 23 before arriving in Kuching on Nov 19. So far, no unpleasant incidents have been reported, Teo said. 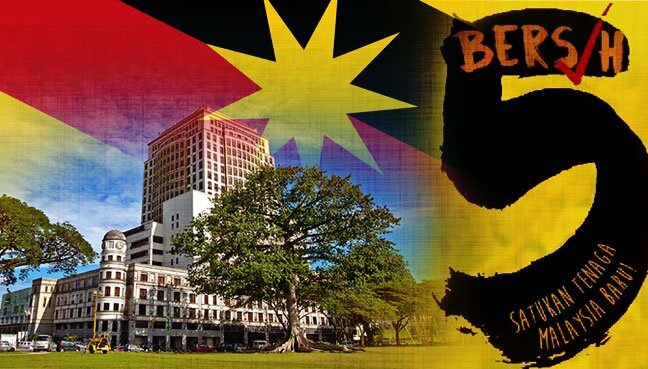 Sarawak Bersih said it chose Padang Merdeka for its historical significance as it had witnessed the declaration of the Federation of Malaysia.